Togo and Arsenal striker Emmanuel Adebayor was named the Confederation of African Football’s Player of the Year on Tuesday. He took the award ahead of BBC African Footballer of the Year Mohamed Aboutrika of Egypt. The award was decided by a poll of African national team coaches, and Caf’s figures gave Adebayor 74 points to Aboutrika’s 53. Adebayor scored 24 goals in the English Premier League last season. He also scored four goals in three games for Togo in their World Cup qualifiers. 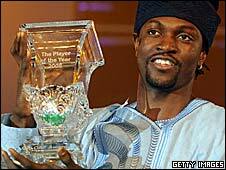 “I’m highly honoured by what I have done in African football,” said Adebayor at the awards ceremony in the Nigerian city of Lagos. Aboutrika won the Inter-Clubs Player of the Year award, for locally based players. His club, Al Ahly, was voted Club of the Year, while Africa Cup of Nations winners Egypt won the National Team of the Year award and their coach Hassan Shehata was voted Coach of the Year. This entry was posted on Thursday, February 12th, 2009 at 7:21 am	and is filed under 还没有归类. You can follow any responses to this entry through the RSS 2.0 feed. You can leave a response, or trackback from your own site.